These systems are a direct bolt on for your 2003-2004 Mustang Mach 1 with the 4.6L motor. Install can be done in a weekend with simple hand tools. This system comes with a HUGE 3 core intercooler standard, and tuning that will support 10psi of boost on the full systems. These systems have made as much as 500rwhp on bone stock Mach 1's with custom tuning, running pump gas. Plus as an added bonus the factory "Mach" scoop remains functional, and aids in bringing fresh cool air to the supercharger. 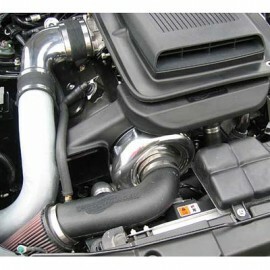 This system takes a stock car that makes 300HP, and adds a 60-70% power gain.